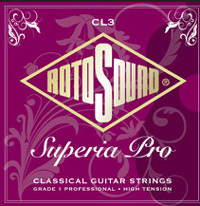 Grade 1 'Superia Pro' classical guitar strings are manufactured to a high tension characteristic specifically designed for fingerstyle playing. The wound strings are Silver Plated Copper on a Nylon Core and the plain strings are high quality smooth rectified nylon. These strings provide high tension playing characteristics and good value.